Visit us at piericatering.com for more information! 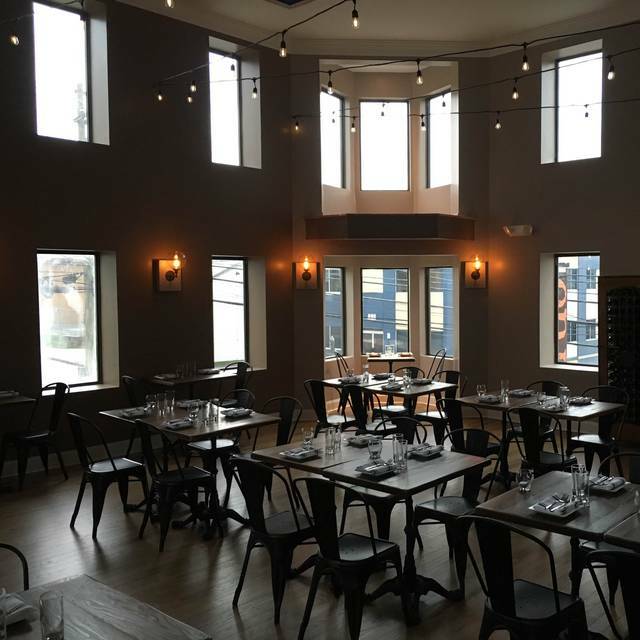 Cerdo, the 3rd Restaurant from Pieri Restaurant group, is the Mediterranean based offshoot of Bar Lucca and The StoneRose in Conshohocken. 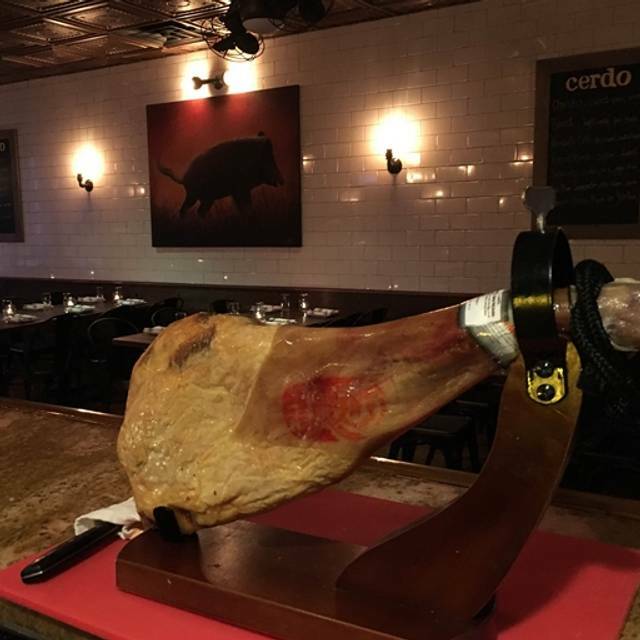 An adventurous old world wine list accompanies our menu filled with dishes inspired by the region ranging from wild boar, to raw selections, to cured hams carved right in our bar area. 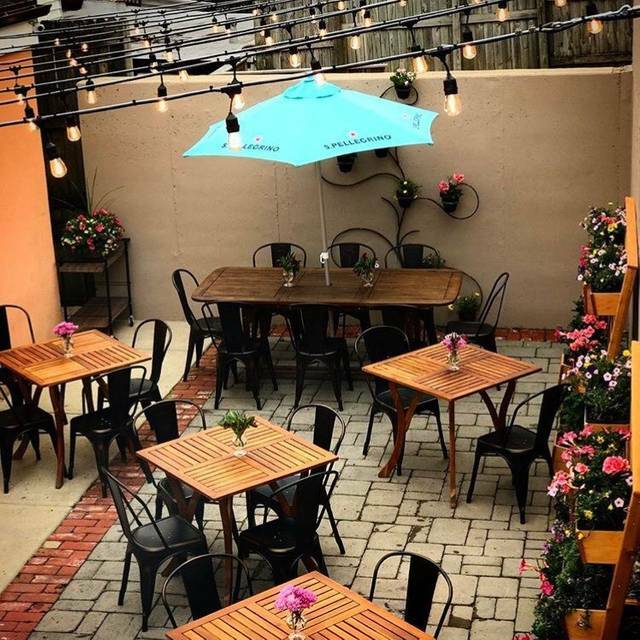 Our energetic environment will take you to your favorite table in Barcelona, or favorite cliff in Sicily while you explore the simple ingredients that define the Mediterranean dining experience. Excellent restaurant with great attentive service. We ordered beet salad. It came out with what we thought was minimal salad dressing. After a few bites we asked waitress for extra salad dressing. Given strong taste we realized it had no dressing. We told waitress and while she apologized we never should have been charged. Waitress had big table she focused on therefore service was average. Excellent service from beginning to dessert! The braised short rib appetizer was excellent! Small corner location that would be easy to miss. The service was very friendly and efficient. The food was superb. Prices are moderate. Didn't love the upstairs seating area, but the food and service were wonderful as always! The service was exceptional. From the time we arrived until the very end we had great service. The food, sadly, was poor. Out pan tomate was burnt. Our croquettes de jamon were cold in the center. The baked ricotta was served with an overly sweet chutney. Our main entree of rigatoni with short rib was served in a watery sauce and was not eatable. We were very disappointed because we really wanted to find a good tapas:Mediterranean restaurant. This was a huge miss. The food was delicious but the service was very slow. Nice setting and services. Good menu options. Always appreciate small plate options. Food is mediocre. Not sure why they charge high prices for poorly executed dishes. My guess is folks in Conshy don’t want to drive the extra few miles to the city where the restaurants are actually worth the money. If this place was in the city, it would be closed. Our party of four ordered the charcuterie platter...as a shared starter....the cheeses and meats were sized for an individual serving...not something that would be shared, as the pricing would suggest. The food was fair. The food was very good. We started with a cheese board. I had the pork loin which exceeded expectations. It was cooked perfectly. the paella was average as was the sangria. The service was great! The only fish option was salmon which was a bit disappointing for a Mediterranean restaurant. Also, ask to get seated downstairs. The upstairs has little ambiance and is incredibly loud due to acoustics. First time I have been here. It looks like it was one time a corner neighborhood bar but looks nothing like a corner bar. It is very nice inside. The app we had was supposed to be baked ricotta with crostini. Odd mixture of garnishes, the crostini was soft white bread. Usually something like that is a staple, took from in Riva though not even close. Scallops were scallops with a mushroom risotto. Nothing great and nothing I would go back for. It does god for people in area. 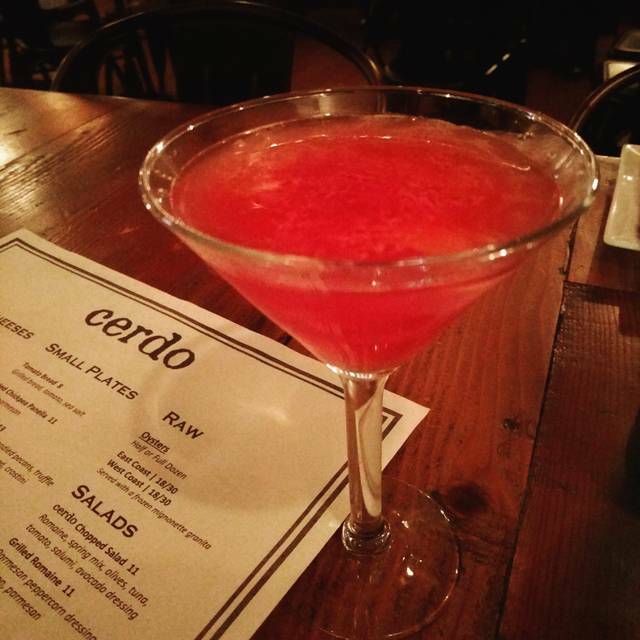 We've been to Cerdo several times and this time we had a reservation but because of the Valentine's Day busy crowd we decided to eat at the bar. The bartender was Brittany and was excellent - much better than the male who used to always be behind the bar. The disappointment came when we ordered entrees and it took well over 40 minutes to come out. In fact the couple sitting next to us [oddly had ordered the same items as us!] received their entrees well before us despite having ordered after us. Note: We felt they were 'friends' of the owner as was apparent the way they were treated throughout the evening. The food was good as usual; needed some extra seasoning but all in all good. The issue is we were made to feel second rate since we didn't 'know someone'. Can’t wait to go back for full menu. Valentine’s Day menu was awesome. Service, from hostess, to bartender, to servers, were always around and attentive, but never a bother. Very nice place. Cozy, hip place. Good menu with a good variety. Splurge on the green tea sorbet for dessert. Limited menu on Valentine’s Day but all their greatest hits - delicious! Joey, glad you enjoyed your Valentine's Day visit! 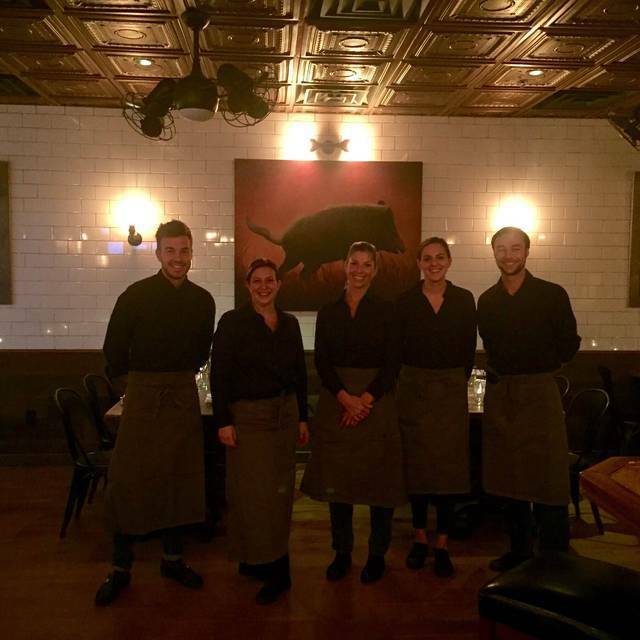 A great dining experience with excellent food, knowledgeable table service, and a nice atmosphere. The food was excellent and the service was great The perfect combination!!! It’s very noisy , not so great in choices in their menu. Didn’t feel like Mediterranean in any dish. My friend and I started with a cheese/meat platter.....the bread crisps were stale and difficult to bite into and chew. The rest of the platter was fine. I had the salmon which was good. My friend had the Butchers ragu which had no flavor. She asked for pepper and parm which really didn’t help. The staff asked if she would like something else and then she got the paella which was just ok, not great. We were really expecting a better food experience. I am not recommending this restaurant because the food was just ok, none of the dishes were a standout, one of them was even below average. Maybe it is our choices to blame, but flavor was lacking. The service is very attentive. Downstairs looks very cozy, upstairs is spacious but doesn't have the same ambiance as the first floor. The food, the service, And the atmosphere was terrific. The owner, John stop by to check in on us and at the restaurant manager is a delight. Totally recommend! Great restaurant with a cool, relaxed vibe. Excellent service with great knowledge of cocktails and food. Like all Pieri restaurants, food is fresh, innovative, and delicious! Highly recommend any of their restaurants in Conshohocken. I don't normally write reviews but I felt compelled because I read a few bad renew related to service before this dining excellence. The food was excellent, as was our waiter, Andrew. He was very friendly, knowledgeable about the menu, and laid back yet prompt. Everything came to our table in a timely manner. Andrew was even well versed in the menus of their sister restaurants, and was able to converse about the brothers at each restaurant. We wanted to try to come back since we hadn’t been here for a while. Got our menus and ordered the mussel appetizer and we both ordered the halibut entree. We were told that they were changing the menu for the season change. Hmmmm ok. No halibut. Got the seafood pasta instead and the mushroom flatbread. Mussels came and were pretty decent. Then the table next to us got served the halibut! We were Told that they ran out of it at 7:45. Okay. The seafood pasta came. Pretty dry and tasteless. Flatbread came. Flooded with cheese. We know for next time not to come here. Too bad! Hi Fireman, I'm sorry to hear about your experience. It is never something we like to hear and we are always trying to improve. We do feel as though we tried to accommodate you the best we could that evening, with moving your table when you were too cold, adjusting the lights when you felt it was too dark at your new table, and giving you a $25 gift card for the inconvenience of running out of Halibut. We do hope that you give us another chance, but if not, best wishes. 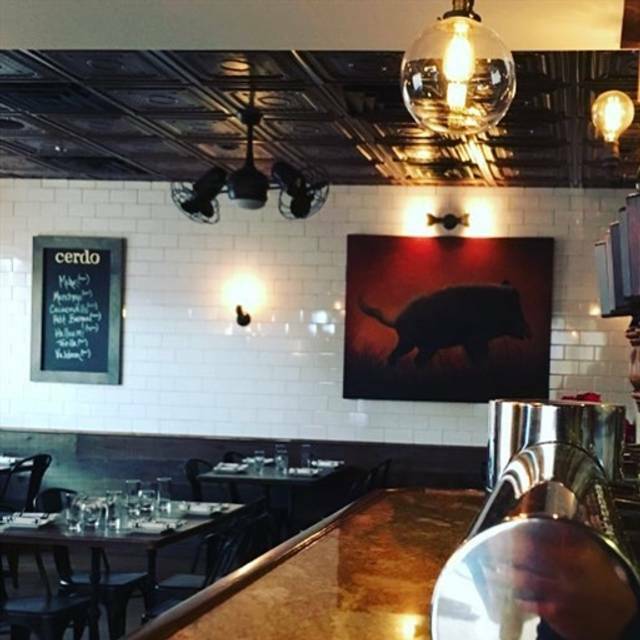 Cerdo had a nice ambience! The food was delicious and I will go back again! Tables too close but it was New Years Eve. Serves was good food was good but couldnt hear partner talking. Delicious food- loved the grilled romaine salad! Everything was delicious and the service was great! What a gem! Best Brussels sprouts ever!!! Cheese and meat board was amazing. Grilled tomato bread was also very good. The duck confit papardelle was good but some noodles clumped together and were doughy. The octopus was good but whatever the chickpea salad was spiced with took over whole dish. The service was good however we were being served by two different people who needed to communicate better. Overall really nice place. The food was terrific but it took a while to get our drinks. Great spot. So glad that we went. Interesting wine selection and menu options! Love the place, the service was outstanding and the food delicious.